Wall-raising day for the new Coast-to-Coast Hardware store at Four Corners. It was “Wall Raising Day” at Four Corners on April 2 for the Coast-to-Coast Hardware store which will move from Wilderness Village to its new site this coming June. 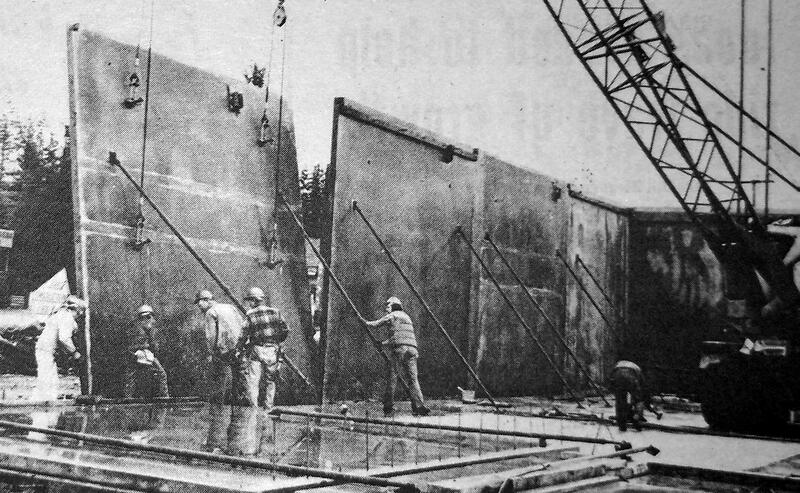 Huge tilt-up panels of reinforced concrete were lifted into place by the crane operator and secured by a half dozen other skilled workmen within 6 ½ hours. It took 22 wall panels to encircle the 420 lineal foot perimeter of the building. The panels were formed and poured right at the site on the already completed concrete floor of the 12,000 square-foot structure, and then lifted into place by the crane. All the plumbing and wiring is already in the concrete, according to Stan Johnson, one of the owners. As far as electricity is concerned, “it’s now just a matter of running wires, attaching boxes, and that sort of thing,” he says. Besides large display spaces, the new open area store include three offices, an employee lounge, stock room, and receiving area. Completion date is set for May 28, according to Johnson, with “fixturing” beginning about May 20, and the Grand Opening due about the second week in June. The upstream face of the Cedar Falls dam shows a water mark at about 1,530 feet—five feet below the sustaining capacity of the dam. At 1,555 feet, water starts to spill over. During the 1977 flood, the water rose above this mark over a period of 30 days and reached a crest of 1,568 feet. Planned construction will bring the capacity of the dam to 1,570 feet and reduce overflow from flooding. While there is no immediate cause for concern there is a potential danger that the Cedar Falls masonry dam on the upper Cedar River could prove unsafe in the event of a major flood, U.S. Corps of Engineers spokesmen told members of the news media at a meeting in the City Light Building in Seattle last Friday. “The dam itself is very stable. It’s the right abutment that presents the problem if you get a lot of rain for a sustained period of time,” said Joe Recchi, acting City Light superintendent. The problem with the right abutment is that it is made up of glacial deposits—sand and gravel—which tend to soak up water and allow seepage from the reservoir side to the other side. Another problem with the sand and gravel there is its susceptibility to erosion. Sustained buildup of rain would wear away at the right side, causing it to either break suddenly or gradually. Masonry pool elevation—Dec. 1977 flood. 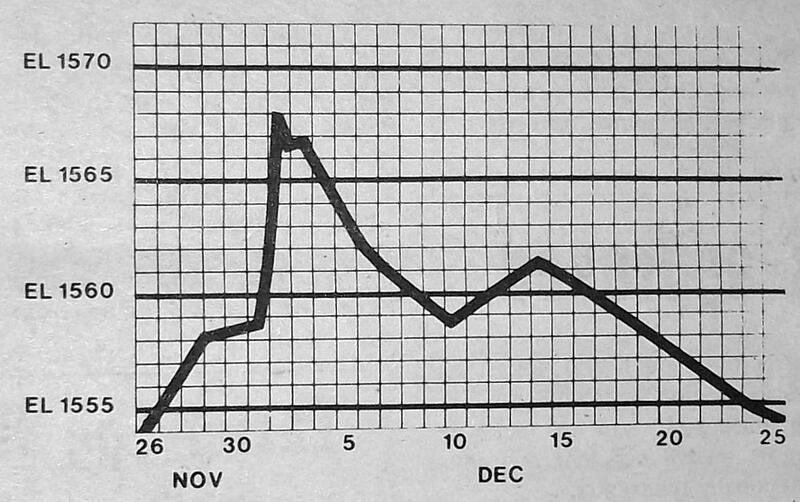 The graph above shows a record made of water levels at Cedar Falls dam during the December 1977 flood. On December 2, 1977, the water level hit a high mark of 1,568—33 feet above the current sustaining capacity of the dam. The Corps of Engineers made an on-site inspection of the Cedar Falls dam March 18 of last year, as part of the National Dam Inspection Program, a joint project shared with the Washington Department of Ecology. Its main purpose is to identify and alert appropriate officials and owners to those dams which may pose hazards to human life or property. There are two dams above the Cedar River. At the end of Morse Lake is a Timber Crib dam constructed in 1904. It is in poor condition, but presents no real problem because the water is really contained by the second dam, at the head of the Cedar River. 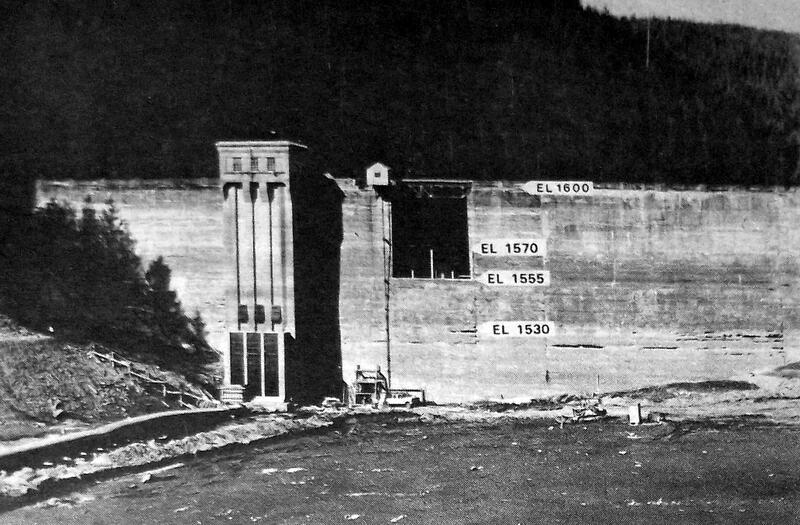 This concrete dam, constructed in 1914, is where the trouble lies. Modification and repair is not a simple matter. The Cedar Falls project is expected to last eight years, cost 50 million dollars, and require joint efforts by Seattle City Light and Water, the Department of Fisheries, the Corps of Engineers, and the Department of Ecology. It will be four or five years before construction can actually begin. Estimates, designs, work licensing, environmental impacts, and assessments must be taken care of before actual construction. Construction will last three years, if all goes according to plans, during which time the dam facility will be shut down for six months to a year. It is estimated that this will cost City Light an additional $3 million in power it will have to purchase elsewhere. The flow will be diverted for department and fishery purposes. The Cedar River supplies 75 percent of Seattle’s water, but the dam shut-down will not affect the current level of the river. The water department will use more water from other sources to make up the difference. The construction is aimed to increase the capacity of handling excess amounts of water. Currently, the dam can maintain a level of 1,535 feet. During the last flood, the reservoir level rose to 1,565 feet. The capacity level is expected to be increased to 1,570 feet. This should hold any flooding. Should a flood occur while construction is taking place, spokesmen said that all attempts will be made to prevent any additional flooding from reaching the valley. “The long-term protection valley residents would gain would far outweigh additional discomfort they would face for a short period of time,” remarked McLaughlin. 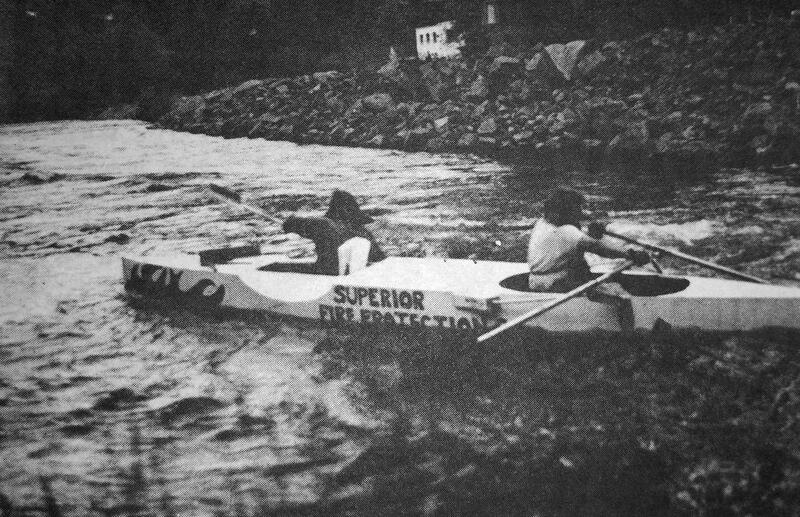 Superior Fire Protection is manned by paddler Bob Moren, a sprinkler engineer, and rower Dave Reynolds, a Sears tire salesman. They’ll be out on Maple Valley Day, June 2, seeking to better their sixth overall rating of last year. Moren says he races “for the competition and excitement of it.” Dave says, “I race to do something different.” Moren raced in 1977 with Harry Honnold in Caruso’s boat. Maple Valley’s corps d’elite—its five outstanding Citizens of the Year from last June’s Maple Valley Day to the present—is about to be named again. Nomination forms are available from the two sponsoring groups, the Greater Maple Valley Chamber of Commerce and the Voice of the Valley. The form will also appear from time to time in the Voice, beginning with this issue. Being sought are a business person, a youth, an educator, a senior citizen, and a citizen-at-large. The five winners, as determined by the board of directors of the Chamber of Commerce, will have their names engraved on the handsome perpetual trophy, which is on display at the chamber office in the Good Earth Works building across from the post office. On Maple Valley Day, June 2, the chosen citizens will be guests of honor during the parade on that day. First and second runner-ups will also be chosen in each category and all will receive certificates. Completed nomination forms must be mailed, no later than May 15, to the Greater Maple Valley Chamber of Commerce, Box 302, Maple Valley, Wa. 98038 or to the Voice of the Valley, Box 307, Maple Valley, Wa. 98038. The forms may also be brought to the chamber office or deposited in the Voice of the Valley box at the Good Earth Works. Extra forms are also available from these sources. Questions should be directed to Doreen Hunt, chamber secretary, at 432-0222. There should be no repeats from former years. Previous winners were: 1976—Joe Mezzavilla, Suzanne Tirk, Beckie Jo Scott, Bill Ziegner, and Kay Scott; 1977—Louie Herrin, Gary Morgan, Bonnie Jo Scott, Louie Duett, and Ann Lantz; 1978—Lucille Matthaeus, Mike Prato, Terry Spencer, Doreen Hunt, and Tracy Engstrom.